As part of the Commemoration of World Refugee Day, the United Nations Volunteers (UNV) programme, UN Refugee Agency (UNHCR) and the National Police in Putumayo, facilitated a training on Refugee Law and organized a radio programme to raise awareness on protection of Venezuelans arriving in Colombia. Marco Nardo, UN Volunteer Associate Protection Officer with UNHCR (centre), Vera Quina, Head of UNHCR Field Office of Mocoa (left) and Germain Bravo, Officer at the Putumayo National Police Department at the National Police Radio 93.2 FM, Police Department of Mocoa, Colombia. Marco Nardo, an Italian UN Volunteer who has been serving with UNHCR in Colombia for eight months, had the chance to join the Commemoration of World Refugee Day in Mocoa, his duty station, located in the south of the country. He serves as Associate Protection Officer, mainly in charge of persons in need of international protection. UNHCR is mandated to promote the worldwide protection of refugees (8 per cent in America) and internally displaced persons (17 per cent in America), together with stateless persons, returnees and asylum-seekers. Due to the ongoing situation in Venezuela, where many people are currently lacking access to basic needs (including access to food and health), Colombia has in the past years become a country of transit or destination to Venezuelans. This is a new phenomenon for Colombia, a nation afflicted by an over 50-year internal conflict, which displaced the highest number of people in the world, currently amounting to 7.7 million (UNHCR Global Trends report, 2018). Colombia actually counts with 4.7 million inhabitants abroad. Of those nationals who left, 400.000 have refugee status or are requesting it. They live in 45 countries of the world. A nation which historically has seen its people seeking protection in other parts of the country or abroad is now host to thousands (if not millions) of Venezuelans. This scenario is not alien to Putumayo, the Department of Colombia where Marco serves. Inspired by humanitarian principles, Marco, together with his colleagues from UNHCR, raised awareness on the hardships faced by the women, men, girls and boys (including those with special needs) coming from Venezuela. 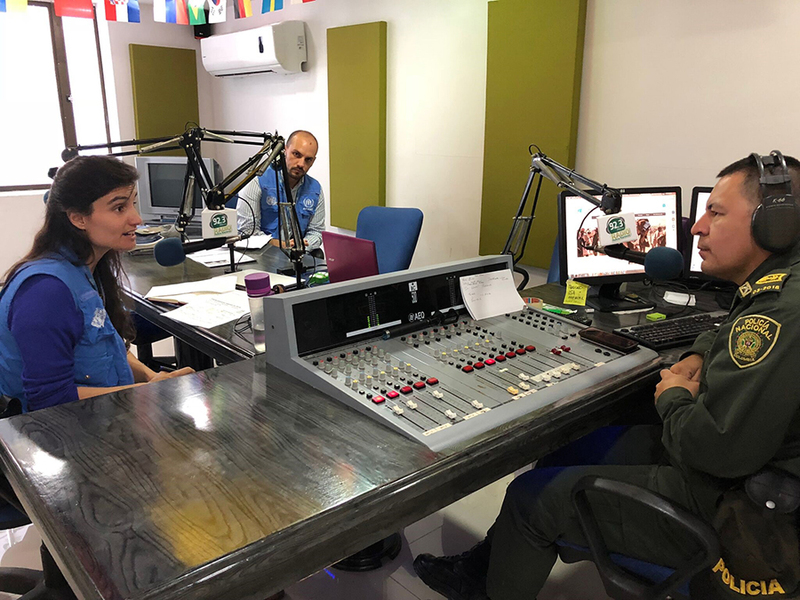 In the framework of the intervention to strengthen Colombian institutions in promoting and protecting human rights of people in need, he organized a radio programme with the National Police in Putumayo, on their radio channel 93.2 FM. This allowed them to have access not only to the police officers but also to the general population of the department who are impacted by the arrival of so many Venezuelans on a daily basis. Moreover, Marco and his colleagues facilitated a training on Refugee Law to the Police Officers in order to improve the response to the needs of Venezuelans and all the people in need of international protection, guaranteeing respect of their rights in collaboration with UNHCR.